The younger generation of Tamils in the country and Tamils living abroad should come forward to contribute to the development of arts and culture in their homeland in Sri Lanka, he said. 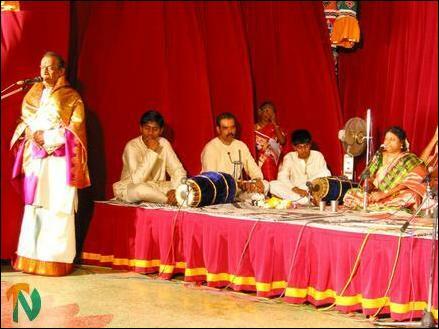 The chief guest of the occasion was the veteran Carnatic musician in Jaffna " Maha Vidwan" (Maestro) Bramasiri N.Veeramani Ayer. Mr. Veeramani Ayer said in his speech that Trincomalee was a divine land. Several centuries ago, Hindu saints had sung hymns praising Trincomalee and its historic Hindu temples. “Trincomalee preserves the pristine glory of Tamil cultural values through its Hindu temples and arts. All Tamils should be proud of Trincomalee,” he said. The Ramakrishna Mission head in Sri Lanka, Swami Athmaganantha, in his message to the souvenir released at the event, praised those Tamils living abroad who have not forgotten their roots and their Tamil culture. The brothers, Cholan and Sipi, sons of Dr.Anandarajah from Trincomalee, now settled in London, played their maiden Miruthangam to the Carnatic music of ‘Vidwan’ Ms. Vijakumary Thavasilingam and Ms. Gayathiri Rajarammohan. 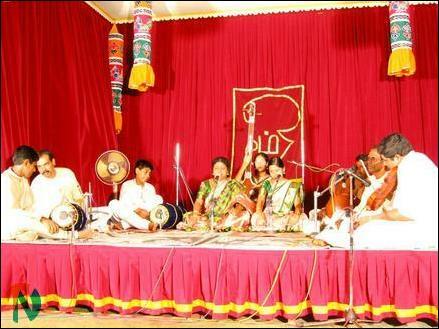 Violin was played by Isaikalamani S.Thipakar, Gadam by Kalaimani L.Jambunathan, Muharsingh by Visaratha Ratnam Ratnathurai and Thambura by Ms. Sivasanagary Rajarammohan, sources said. Cholan and Sipi are disciples of Mirthanga Vidwan Sri SomasundaraThesigar, who began his tutelage under Sri A.S.Ramanathan at the Ramanathan Academy ( now Jaffna university Fines Arts Faculty) in Sri Lanka. Chief guest Maha Vidwan N.Veeramani Iyer speaking.